Hey guys! what's up? this is Jasmine. I'm a recent moderator to Tarkan United! i have been enjoying this status ever since i was assigned by awesome Olga! I'm Egyptian-Turkish...I'm also American...i would love to help any of you with anything needed to increase your support to Tarkan! Congrats for the forum! It looks fantastic! My name is Ekaterina, I live in Moscow, in Russia. I am very glad that have joined you. Accept me in the numbers. Merhaba! Ne Haber? My name is Nicole Ezra and I am a one of the moderators of the best club ever, TARKAN UNITED!!!!!!!!!!! I am 23 years old and reside in HOUSTON< TX BABYYY!! I share the same admiration for the best creation on earth (Tarkan, duh) as the rest of you, and look forward to celebrating his presence and succes along with yall!!!! Humor : If you're talking to me you must be sure I have the ear plugs off! Hi this is Kika....is this where they give out free beer and Tarkan cds? Ok I'm kidding, I'm Kika from Athens, Greece and thank you Olya for this forum, I think it's great! Tarkan would appreciate it too...if he could type fast enough Just kidding! But I sure hope so he posts one day! Cheers to all the members and a high-five for the moderators!!!! ...oh don't worry...I don't drive!!!! Hi guys! I'm Bojana (you read Boyana ) from Serbia! I'm glade to be here with you!!!! I am Stephanie from the United States. I am very happy to be a part of this group. Everyone is so great. I am a new fan of Tarkan's and just by chance I heard Simarik and then I checked him out on you tube and now I am totally and completely in love with his music. I listen to him daily. And thanks to you guys I have learned so much more about him and have kept up with information about him. I am glad to be able to meet others who are as fond of him as I am. Hope you enjoy Tarkan_United Forum and we look forward to continuing your learning experience of the lovely Tarkan!!! Finally, I did my account here LOL! So, I am very glad to be here and share our passion: TARKAN! (of course ) !! Hi ! i'm francesca , 24 years old from Italy!! Helloooo to all! Well,I have a question for Francesca! First,nice to see a HIM fan here! Cuz my first thought was a singer,Görkem,from one famous Turkish rock band named Çilekeþ... It's probably not,huh? Hope this is not too personal! but..is true that gorkem is a name used both male and female people?? Thank you very much for your answer! That nick is really sweat! I am Imelda (Melzee) from U.S.A. (California) I'm American/Mexican. 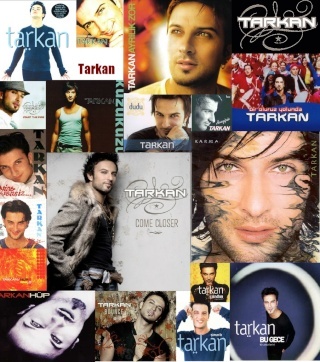 I am a new fan of Tarkan's. I came across Tarkan's music by chance one day on YouTube. The song: KUZU KUZU. I wasn't paying attention to what I was doing and happened to click on this song. I continued multi tasking and when I heard the song and the voice especially, I was like..... wow, and went back to see who I click on, and from then on I have been amazed by his music and have become a fan. Then I found this place and I am greatful for this forum and everyone who part takes in it and makes it happen. Thanks for letting me be part of this group. Im glad you have joined us, and all the fun. We are proud to assist you in your new journey of exploring the Crazy but Beautiful indeed, Tarkan! !